WHEN trying to decide the difference between a restaurant and a café, a few words kept coming up ‘small’, ‘informal’, ‘cheap’, while a restaurant is ‘formal’ and ‘service orientated’. None of this explains how McDonald’s gets to count as a restaurant (even Maccy Ds agrees - it tried to get itself classified as a supermarket for tax purposes a few years back). My rule of thumb is that if you could imagine a bunch of new mums bonding over lattes and lactation issues there, then it’s a café. It you feel like rolling rather than walking home after eating there, it is probably a restaurant. Chapati Café is the exception to my rule. It definitely ticks all the small/cheap/informal boxes, but I don’t expect to see the locals doing a coordinated breastfeed over rice and three (then again, it is in Chorlton). It’s a small joint that seems to have sprung up in someone’s conservatory. The décor is basic, but clean, light and airy with cheerful pops of colour. It’s spiritual cousins are Northern Quarter's This ‘n’ That and its brethren the now sadly defunct Chennai Dosa in Stretford, only of course with its own Chorlton touches. Chapati Café is also quite cheap, filling a hole in the otherwise pretty well-stuffed Chorlton eating scene. It’s certainly informal, serving a selection of thali dishes that are made to be scooped, shoved and sometimes slurped into the mouth with abandon. 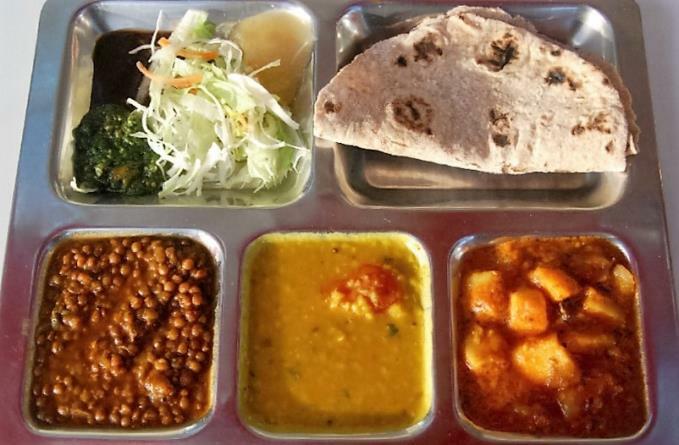 A thali is both name of the actual eating dish, and the general style of eating. The stainless steel serving tray, not unlike something you might find in a prison, is the thali, but the whole informal meal is also a thali. In the Chapati Café version you get three curries (either all meat, all veg or a combo, ranging from £4.95-£6.95), either rice or chapatti and a salad that is more decorative than useful with plenty of homemade chutneys on the side. The curries change daily but regularly reoccur. Chapati Café is also very popular as a takeaway, either that or the deliveroo guy has a serious crush on the girl behind the counter. We ordered a full set of curries, some mystery items that were only labelled as ‘snacks’ (to be fair, there was a distinction made between ‘meat snacks’ and ‘veggie snacks’ so that cleared everything up), a couple of poppadoms and a couple of cobras (£3 each). There was also small bottles of wine on offer, as well as the usual pops, teas, coffee and chai. As for the important stuff (main image), the lamb navsari was cooked on the bone and melting tender, infused with cumin, cardamom, clove and chilli, it was well spiced without being too fiery. The chicken hasapoor (not a name I’d heard of before) was a delicate yet warming dish. The aubergine was my absolute favourite, rich, oily, smoky with paprika, I probably could have eaten a whole thali just of that. The veggie tray included a ‘potatoes’ curry that fell just short of blowing my head off, and a tasty masoor (lentil dal) where the lentils held their shape nicely without being hard or chewy. In contrast, the third element was a gentle, slightly wet dal that advertised itself as made from pigeon peas, which I found out later is another name for the oily split pea called toor dal. As you can tell, it was the odd ingredient that made the lasting impression over the actual dish itself. As for the sides and sundries, the poppadums were speckled with cumin seeds, not that I could taste them, as the overlarge crisp was incredibly salty (drink more beer). The homemade chutneys were good – the chilli was especially sizzling, but my personal favourite was the sweet-sour tamarind. The mysterious snacks turned out to be samosas (meat, £3 for four, veg £2.50 for four), the veggie one being the stand-out as I could really taste some lemony-coriander flavours in among the usual suspects. The potato vaada (£2.50 for four) was a bit forgettable but made a handy medium for getting extra curry into one’s mouth. The chicken pop was the only real failure - very dry and tough to eat. There weren't really desserts available as such, except for, and I suspect this is quite unusual in the rice-n-three world, a ruddy good brownie (made by Lush Brownies). Very fudgy and rich, it was studded with cardamom and pistachio, which lifted it above the average brownie to something quite delicious. So, Chapati Café is a fine place for a properly satisfying meal whilst fulfilling your more traditional café needs... which may or may not include coordinated breastfeeding. Chapati Café, 496B Wilbraham Road, M21 9AS.